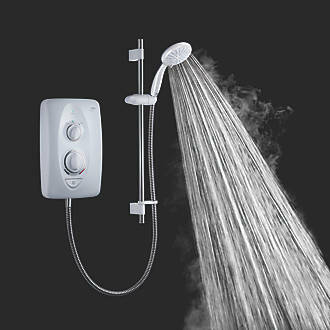 This Mira sprint in our honest unbiased opinion based on many years experience of shower fitting is SUPERIOR to equivalent offerings from Triton - Gainsborough - Bristan - Creda. We base this opinion on customer satisfaction and with the lowest number of call backs/ guarantee claims or faulty units not working straight from the box. With a large footprint this unit will cover existing fixings. The unit has a large chunky stop start button with large easy to use rotary dial for the temperature setting and separate dial for the power setting. Included as standard is the clear scale technology which Mira boasts will achieve a 50% prolonged life. Call us to order this now !